God's Sufficient Grace: Yellow Shirt Day! 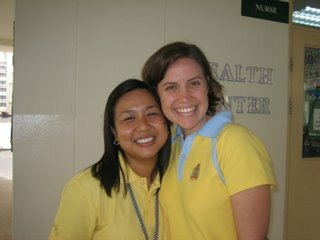 You mentioned that the King likes yellow so everyone wears yellow on Monday. Is this an optional thing? Or is it a law there? 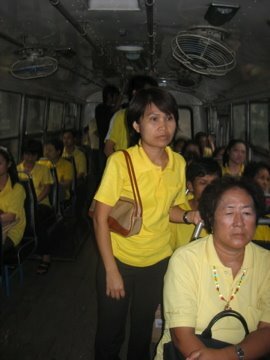 Love the pic from the bus with all the yellow shirts! 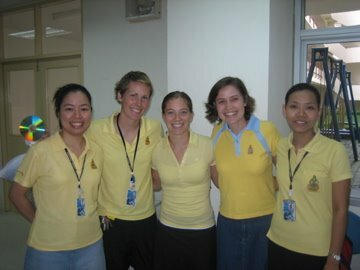 About the yellow shirts...the King was born on a Monday and Mondays color is yellow..thus all the yellow. However, this year because of the King's 60th anniversary as King he has ordered that all government workers wear yellow every (Friday, I thought but I am thinking it might be Monday now.) At any rate, the Thais are caught wearing yellow any day of the week; there are always a lot of yellow shirts around. All I can say is...WOW! Yellow!